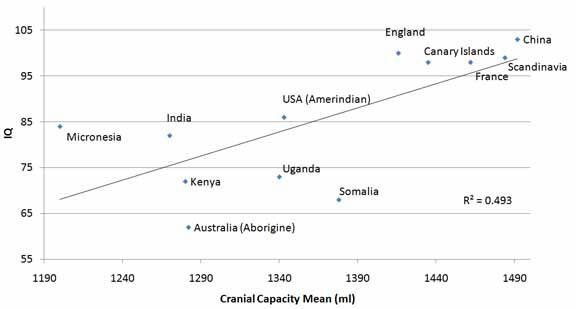 This is one of the best HBD studies have have found, linking brain volume and head circumference to IQ, while controlling for socioeconomic status. Not only is the brain on the right smaller, there are fewer convolutions and wider gaps between them, indicating less surface area of the cerebral cortex, which could explain the low IQ. However, the second example that of two female participants didn’t show much of a macroscopic difference. This study deals a blow to the ‘blank slate’ hypothesis. A smaller brain logically means a smaller cerebral cortex and hence fewer neurons and less intelligence. The ‘blank slate’ implies that differences in achievement can be rectified through government intervention, or that IQ is a social construct, but how can such intervention possibly overcome a difference that is as intrinsic and inviolable as the actual volume of the brain itself? It’s not like you can make a brain bigger through medication, social programs, or therapy (as in the case of a mental disorder). This goes one step beyond merely a mental disorder to an actual physical aberration. A behavior pattern is different than IQ. 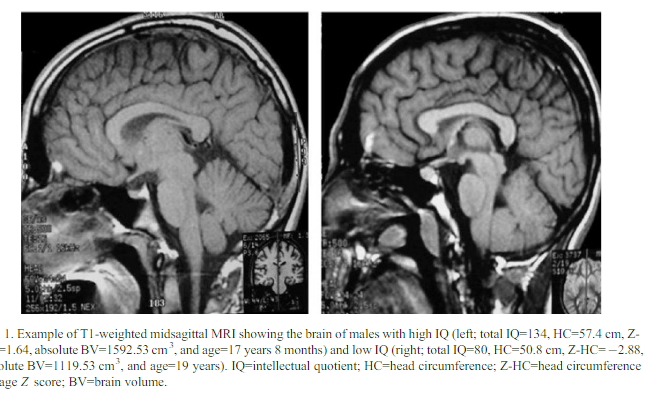 IQ, like height, is fixed, whereas behavior can be modified. Maybe that’s why China is so economically successful despite having emerged from market-communism just 35 years ago, whereas other countries that have had much longer head-starts have fared much worse. Both high-IQ countries and high-IQ individuals tend to rise to the top.